A Calming and Clutterless Space. I came across this image in an Apartment Therapy House Tour a few weeks ago, and found it so incredibly calming…and encouraging. It very much speaks to my personal belief that just because you have a child, you don’t have to have a living room that looks like a Gymboree. Not that Gymboree is bad, or that if your living room looks like one that’s a crime. It’s not. But this is nice, right? Specifically, some of the things I really dig about the above image are the sleek sofa (I confess, the tufting and style are very similar to my own, though ours is a warmer leather color, which has held up quite well to hand prints and toy missles), the lack of fear about sharp corners (ok, maybe this is just for the photo), and the addition of a soft rug to cozy it up just a bit. It’s a fairly extreme example of “less is more” but for me, it works. Now you’re wondering if I practice what I preach, right? 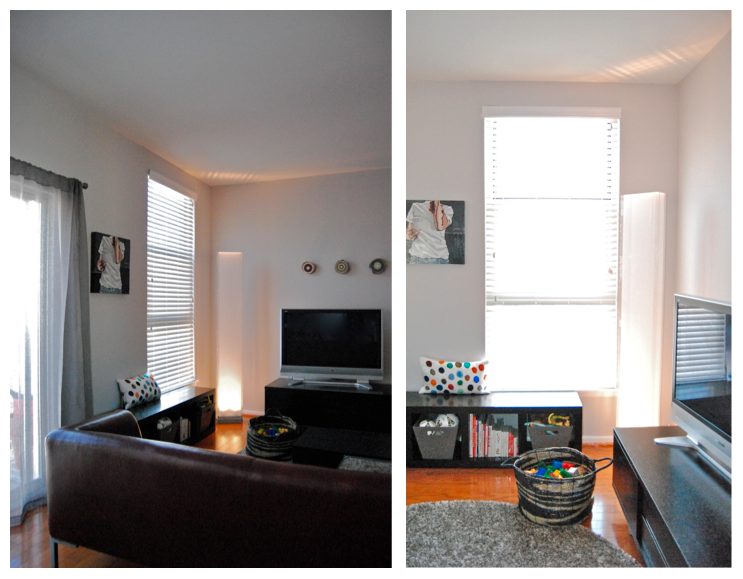 I do – here’s our living room, which is quite simple, uncluttered, and fairly modern (and bright — gosh, is it bright!). Please ignore our (not) kid friendly art. We have opted to store toys and books in bins underneath a simple bench in our (small, open plan) living room, which might I add, serves as a main play area for our son (we don’t have a basement, but we do also use his room for toy-storage). This all said, I realize that to enact a plan like this one you have to make sacrifices: we don’t have ride-on toys inside our house and we’ve decided to have a “grocery store” (i.e. a toy cash register and bag of faux food) in place of a behemoth play kitchen. But aside from the few days a year that I’m stricken with major mom guilt, I feel good about this and my son is just about the happiest little guy you’ll ever meet. AND BEST OF ALL, when he goes to bed my husband and I can reclaim our space in a flash. I had a feeling I’m not the only one choosing to live like this, and Joyna and Brad proved it! 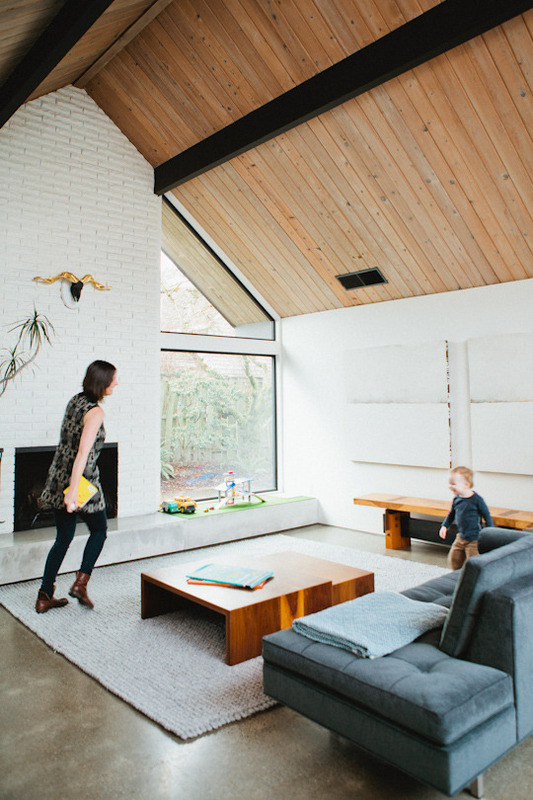 See the rest of their House Tour @ AT here. That all said, for those of you with lots of space that includes a designated room for a deluge of colored plastic, realize what a luxury that is!